I am on the final chart in the body of the Shetland Tea Shawl. It requires a bit more attention than charts past. There is action on every round. That is to say, there are not plain knit rounds alternating with lace rounds. This makes for finding a stopping point a little more difficult. It is easy to keep going, because the natural resting points just are not there. However, my energy and concentration levels force me to take breaks. Sometimes, I want to keep with the fiber pursuits, but am not up for much action. This is where planning and plotting can be good uses of my time. However, I am not interested in becoming stuck focusing on all the things I want to knit, and the resultant frustration at not doing it all right now. I want to keep the enjoyment going. The time to plan my participation in the personal sock club arrived. After risking life and limb to retrieve the package of brown lunch sacks, I was committed to the psc. Seriously, that was a more trying endeavor than I had expected. Anyway, once the bags were in hand, it was time to fill them. I flipped through books and magazines. I perused patterns on Ravelry. I examined the sock yarn stash. There is less than I had thought, and this is good. I consulted the Sock Madness 3 supply list. Before I knew it, the time had come to seal the sacks and wait for the first day of March. I have to remember to sign up for Sock Madness that day, too. I finished the first two amigurumi creations from my new book. These were fun and easy to make. 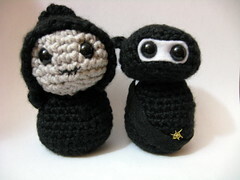 The ninja is going to a nephew for his birthday. Death still needs a sickle. When I pick up a toaster oven, I will use it to bake polymer clay accessories. I do not know why I never thought of that for the eyes, but it will be perfect. Anyway, I also finished the amigurumi tiger I started last year. I forgot to take a picture of it before giving it away. I will endeavor to remedy the photo situation, soon. There are plans to get together with the family this weekend for a birthday party. Speaking of birthdays, I know I need to crochet an amigurumi critter for my niece. She will feel hurt if her brother gets one for his birthday, and she does not. I just need to figure out which one I think she would like the best. I am thinking that perhaps the vampire queen, sheep, or maybe a turtle would be right for her. No, I am not in the habit of giving a present to siblings of the birthday child. This niece and nephew is a twin set. Next up--dishes and laundry. Of course, the spinning wheel is singing to me, beckoning me to spend a bit of time, telling me to not set the timer. My sister has a new puppy called Lucy. She seems like quite a sweetie. I have a new book. I do not think you can call any of the critters in it sweet. The weekend flew by for me. Valentine's Day was good. I suppose I like that day the same way I like Thanksgiving. Love and thankfulness are for every day of the year, but it is nice to spend a day giving extra attention to them. We are mostly silly about the day, liberally sprinkling our conversations with cutesy pet names. Anyway, I was also not feeling well for a good bit of the weekend. My back did not like the way I moved, and has been taking it out on me since. It has kept me from the spinning that I want to do. I am glad that I seem to have recovered well enough to go for my ten minutes today, but I had better not push it. Beyond that, I alternated between feeling cruddy in a general way and extra sleepy. It seems to have passed, but it did cause me to lose large chunks of the weekend. My constant companion has been the Shetland Tea Shawl. I just keep knitting away on it wherever I am. The growth of the piece might be what makes it a less portable project before lace complexity does. 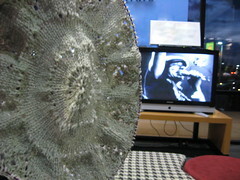 It is now well beyond the stage where a photograph shows much more than a giant lump of knitting. At a baby birthday party, people kept asking what I was knitting. My answer was that it will be either a shawl or a blanket, depending on the finished size. It is a wonderful piece, and I love it so far. However, I am beginning to think it might become a gift. Speaking of things I have been thinking, I am warming up to the idea of the personal sock club. I have loved watching other people participate in it, but have not felt it was a good match for me. Besides my last pair of socks, I have not been knitting them lately. However, I enjoyed knitting my Marlene socks, and feel the desire to knit more socks. That is what got me thinking about the club. Then I remembered that Sock Madness 3 will soon be upon us. Still, part of the point of the psc is making it your own. Maybe I can think of something that will work for me. A few minutes here and there can add up over time. You might think this is going to be about spinning ten minutes each day, and it could be. Yes, it could be, but only if I had been spinning. I have not been making time for that lately, but that is changing. Today, the minutes adding up refers to the knitting I was able to do today. Bruce (feeling a bit better) received a phone call from a visiting, out-of-town friend. They made plans for lunch. With this particular friend, going to lunch usually means we will not return home until after dark. In preparation, I made a working copy of a pattern, and packed the knitting bag. It was already full, so out went some yarn and the wip that might have a date with the frog. In went a book, a pattern, and two current projects suitable for on-the-go knitting. While Bruce drove to Popeye's, I worked on the Yoruba Bird hat. Before lunch was over, I had begun wishing I had brought the knitting bag inside with me. Afterward, Bruce's friend needed a new headlight, so we were off to the auto parts store. While they changed the bulb and talked cars, I knit more of the hat. I soon ran out of black yarn, and I had not brought along more, so it was time to switch. This was just as well, as it was less convenient to keep checking the book, knit, and chat. Still, if I had more of the black, the only thing left to knit for the hat would be the bird. Anyway, my Shetland Tea Shawl was much better suited for the occasion. I had just begun it yesterday, and I was ready to start the first chart. A few rounds into that lace pattern, the guys decided that test-driving cars was a good idea. It felt as though the stitches were flying off the needles, so I did not mind. I just kept knitting. I knit through the test drive. While they talked with the salesperson, I knit some more. The television in the dealership was tuned to vh1 classic, which was airing nothing but AC/DC. The next thing I knew, it was time to leave. I had completed the chart and moved on to a section of plain knitting. By the time we got back home, I was almost ready to double the stitches again and begin the next chart. I did some calculating, and I knit over 2700 stitches while we were out, just on the shawl. While this is not a huge number when you consider the amount of time we were gone, it is a nice bit for the moments grabbed here and there. Am I an easy mark, or what? At first, I just had a nice laugh as I read the dares. Before long, my mind had wandered to the stash, and I was mentally running through possibilities. As soon as I chased away a headache, I was digging through yarn bins and casting on 118 stitches. Then I remembered to prevent another potential pain by checking errata. I may have a new hat before the end of the week. This project came along at the right time. My other knitting has been giving me trouble, and I have not quite found the next thing I need to knit. The Yoruba Hat has been a great companion today. It has kept my interest, but been easy enough to set down when I needed to do other things. My poor Brucie-Pie is ill. I hope this is not the flu. He has needed my help throughout the day. If he feels the same way in the morning, I will take him to the doctor. If he gets feeling much worse during the night, we will be on the road. I suppose I ought to get a bag together just in case. No, it is not a treasure hunt hint. We are in the midst of a predicted string of 70+ degree-days. So, of course, this means I have a finished pair of alpaca blend socks. I do not really feel like the two are connected. While I do live in my head more than a bit, I have not begun believing that the weather changes solely to affect my life. I finished knitting these socks on Saturday. Once I found my rhythm, they sailed along quickly. The chart was easy to memorize. I chose to knit only five repeats on the leg because that length seemed right to me. I also substituted a short row heel and worked the toes plain. The yarn is so soft, pretty, and a delight to knit. The only thing that bothered me is what I see as a difference in color between the two skeins. According to the labels, they were from the same dye lot, but they look different to me. Last week was not the best week. However, it was not without its good moments. I baked bread. It turned out much better than the first two loaves. I felt confident enough to share some of this loaf with more of the family. Maybe I will be baking extra bread this week. We had the opportunity to keep our niece a bit more than usual. She is an interesting little girl. We learn new things about each other every time we get together. She is pleading for a new amigurumi bunny, as something happened to the first one. We had a long talk about taking care of our belongings, and she assures me she will care better for a new bunny, and even has a place for it in her room. She has the most expressive little face. We look forward to the next time she comes over. It had been a couple of months since my last time at Monday night knitting. I decided to go tonight, but was more than a little late. By the time I arrived, there were just a couple of knitting magazines left on a table. I sat and knit four or five rows of my lace, looked through the magazines, and left. It surprised me, as that crowd often gets started a little on the late side, and the last hour is usually the best. I collected the mail from the mailbox when I got home, and my mood was brightened. I had received a package, and I knew what it contained. I recently purchased a used copy of Folk Hats, and it arrived today. It is a bizarre little volume, but some of the patterns in it caught my eye. I held off purchasing it, but when I saw the chance to pick it up at a bargain used price, I jumped at the opportunity. My love for Groundhog Day is known far and wide, but understood by few. Even I have difficulty explaining my love for this day. I tried describing the holiday to my nephew with the hope that he would be excited about the day, but it would seem I have failed. I told him that if the Groundhog sees its shadow, there will be six more weeks of winter, but if the Groundhog does not see his shadow, spring will be here in six weeks. First, he scrunched up his face in puzzlement. Then he declared the whole thing to be stupid. He is now trash-talking the Groundhog and its day. Fear not, for I am far from giving up on him. I have mixed feelings over the best way to spend this day. I just try my best to make it special. I have been known to use the Groundhog's shadow results as an excuse to leave the house or to stay home in accordance with my desires. It has been suggested that I follow the Groundhog's ruling when deciding whether to attend Monday night knitting. Of course, being in serious hibernation mode, it would have been a surprise if I had gotten out of bed during daylight hours. During the time that I am awake, I have been knitting. I have begun the second sock. I am ready to begin the second glove. 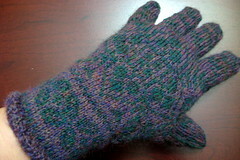 Yes, I have finished the first glove. I like it, and am excited at the prospect of having a new pair of gloves.